A premium, complete feed for show calves, specially designed for beef heifers and steers from 300 to 700 pounds in bodyweight to prepare them for sale and/or to be used as a receiving ration afterward. Highly palatable formula encourages consumption and helps keep animals on feed, even in new and unfamiliar surroundings. Carefully balanced energy, protein and fiber help lessen the risk of digestive disorders with a positive energy balance to support growth during periods of stress. Support the immune system response (selenium, Vitamins A and E). Help keep animals hydrated (potassium). Promote a healthy rumen microbial population to support feed intake and digestion. Support hair coat health and shine (key ingredients and nutrients). Support active nutrient supplies of amino-acid and specific trace mineral complexes for copper, zinc and manganese. To get your show calves off to a winning start. Be sure to gradually transition diets, adjust feed amounts accordingly, and monitor body condition and performance closely. 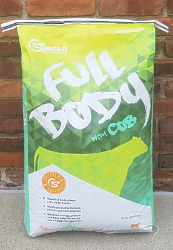 Feed Sunglo® Full Body™ feed as the sole ration 30 to 45 days before and 15 days after sale date. Use the Feed Sunglo feeding table below as a guide for feeding your show calves. Actual intake will vary depending on the animal’s age and weight. After Sunglo® Full Body™ feed, switch to the Sunglo® Show Calf Grower or Show Developer ration and continue on one of those rations through the growing period. We recommend you switch to Sunglo® Show Calf Finisher a minimum of 120 days before the show date. Day 1: Feed hay free choice with 5 lb. of Sunglo® Full Body™ feed per head, divided into two equal feedings. Day 2: Feed hay free choice with 8 lb. of Sunglo® Full Body™ feed per head, divided into two equal feedings. Day 3: Feed Sunglo® Full Body™ feed free choice with free-choice hay. Hay is optional after Day 5. Feed 1–5 lb. of Full Body™ feed mixed in with feed to achieve a desired fuller look.